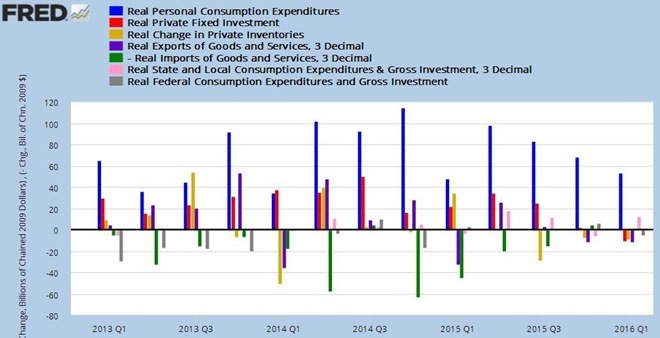 Total real personal consumption expenditures (PCE), the largest component of GDP, were unrevised from the 1.9% growth rate reported last month. That growth figure was arrived at by deflating the 2.2% growth rate in the dollar amount of consumer spending with the PCE price index, which indicated inflation at a 0.3% annual rate in the 1st quarter, which was also unrevised from a month ago. Real consumption of durable goods fell at a 1.2% annual rate, which was revised from a 1.6% drop in the advance report, and subtracted 0.09 percentage points from GDP, as a drop in consumption of automobiles at a 11.5% rate more than offset an increase at a 9.3% rate of in real consumption of recreational goods and vehicles, while growth in consumption of other durable goods was down as well. Real consumption of nondurable goods by individuals rose at a 1.3% annual rate, revised from the 1.0% increase reported in the 1st estimate, and added 0.18 percentage points to 1st quarter economic growth, as higher consumption of food and energy goods more than offset a small decrease in consumption of clothing. At the same time, consumption of services rose at a 2.6% annual rate, with all categories of services contributing to that growth, revised from the 2.7% growth rate reported last month, and added 1.20 percentage points to the final GDP tally. Meanwhile, seasonally adjusted real gross private domestic investment contracted at a 2.6% annual rate in the 1st quarter, revised from the 3.5% shrinkage estimate reported last month, as real private fixed investment shrunk at a 1.5% rate, rather than at the 1.6% rate reported in the advance estimate, while the contraction in inventory growth was somewhat smaller than previously estimated. Investment in non-residential structures was revised from shrinking at a rate of 10.7% to shrinking at a 8.9% rate, and real investment in equipment was revised to show contraction at a 9.0% rate, worse than the 8.6% contraction rate previously reported. At the same time, the quarter's investment in intellectual property products was revised from growth at a 1.7% rate to shrinking at a 0.1% rate. On the other hand, the growth rate of residential investment was revised higher, from 14.8% to 17.1% annually. After those revisions, the decrease in investment in non-residential structures subtracted 0.25 percentage points from the 1st quarter's growth rate, the decrease in investment in equipment subtracted 0.56 percentage points from growth, the lower investment in intellectual property was not enough to matter, while growth in residential investment added 0.56 percentage points to 1st quarter GDP. In addition, the growth in real private inventories was revised from the originally reported $60.9 billion in adjusted dollars to show inventory grew at an inflation adjusted $69.6 billion rate. This came after inventories had grown at an inflation adjusted $78.3 billion rate in the 4th quarter, and hence the $8.8 billion smaller real inventory growth than in the 4th quarter subtracted 0.20 percentage points from the 1st quarter's growth rate, in contrast to the 0.33 percentage point subtraction due to slower inventory growth shown in the advance estimate. Since slower growth in inventories indicates that less of the goods produced during the quarter were left "sitting on the shelf”, their decrease by $8.8 billion meant that real final sales of GDP were actually greater by that much, and therefore we find that real final sales of GDP grew at a 1.0% rate in the 1st quarter, revised from 0.9% in the advance estimate.. The previously reported decrease in real exports was revised smaller with this estimate, while the reported increase in real imports was revised to show a decrease, and as a result our net trade was a smaller subtraction from GDP rather than was previously reported. Our real exports fell at a 2.0% rate rather than the 2.6% rate reported in the first estimate, and since exports are added to GDP because they are part of our production that was not consumed or added to investment in our country, their smaller shrinkage subtracted 0.25 percentage points from the 1st quarter's growth rate, a bit less than the 0.31 percentage point subtraction shown in the previous report. Meanwhile, the previously reported 0.2% increase in our real imports was revised to a 0.2% decrease, and since imports subtract from GDP because they represent either consumption or investment that was not produced here, their shrinkage added 0.03 percentage points to 4th quarter GDP. Thus, our still weakening trade balance subtracted a net 0.21% (rounded) percentage points from 1st quarter GDP, rather than the 0.34% percentage point subtraction resulting from net negative foreign trade that was indicated in the advance estimate.. Finally, there were few revisions to real government consumption and investment in this 2nd estimate, as the real growth rate for the entire government sector was unrevised at a 1.2% rate. Real federal government consumption and investment was seen to have shrunk at a 1.6% rate from the 4th quarter in this estimate, which was on net unrevised from the 1st estimate. Real federal outlays for defense were revised to show shrinkage at a 3.6% rate, same as previously reported, still subtracting 0.15% percentage points from 1st quarter GDP, while all other federal consumption and investment grew at a 1.6% rate, rather than the 1.5% growth rate previously reported, and added 0.04 percentage points to GDP, just as before. Note that federal government outlays for social insurance are not included in this GDP component; rather, they are included within personal consumption expenditures only when such funds are spent on goods or services, indicating an increase in the output of those goods or services. Meanwhile, real state and local consumption and investment grew at a 2.9% rate in the quarter, which was also unrevised from the 1st estimate, and added 0.31 percentage points to 1st quarter GDP. Our FRED bar graph below, which can also be viewed as an interactive at the FRED site, has been updated with these latest GDP revisions. Each color coded bar shows the real inflation adjusted change, expressed in billions of chained 2009 dollars, in one of the major components of GDP over each quarter since the beginning of 2013. In each quarterly grouping of seven bars on this graph, the quarterly changes in real personal consumption expenditures are shown in blue, the changes in real gross private investment, including structures, equipment and intangibles, are shown in red, the quarterly change in real private inventories is in yellow, the real change in imports are shown in green, the real change in exports are shown in purple, while the real change in state and local government spending and investment is shown in pink, and the real change in Federal government spending and investment is shown in grey. Those components of GDP that contracted in a given quarter are shown below the zero line and subtract from GDP, those that are above the line grew during that quarter and added to GDP. The exception to that is imports in green, which subtract from GDP, and which we show on this chart as a negative, so that when imports shrink, they will appear above the line as an addition to GDP, and when they increase, they'll appear below the zero line. Here we can clearly see that other than personal consumption and state and local spending, all other sectors of the economy shrunk in the first quarter. It’s also fairly clear from this graph that our personal consumption expenditures have underpinned GDP growth over the past three years, while increasing imports have been the major subtraction from economic growth.